I have to tell you about an exciting new series I've stumbled upon! 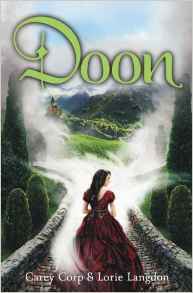 Doon by Carey Corp and Lorie Langdon. This story is follows friends Mackenna and Veronica as they stumbling into an exciting adventure in Scotland. What if you dreamed your fantasy into life? Well, that is exactly what happens to Veronica. Fantasy is easy and reality is much harder to figure out but thankfully she has her best friend to help along the way. This book is filled with fantasy as you travel to another world the world of Doon. Time stands still and moves on there almost at the same time. With the mystical doors only being open once every 100 years the girls arrival really shake things up. In the first book of the new Doon Novel series, Veronica and her best friend, Mackenna, travel to Scotland for the summer in hopes of finding some peace. But the Scottish countryside holds a host of secrets—including a passageway to a mysterious land that appears to be a living fairy tale. In the land of Doon, the girls could have everything they’ve ever longed for … or end up breaking an enchantment and find themselves trapped in a world that could soon become a nightmare. You can pick up your copy of Doon at your local retailer or online at stores like Amazon. Be sure to visit Blinkybooks for additional information including author interviews and peeks at the next 3 books in the series!